What does this earth mean to you? When I was very young, my Mother would take my sister and I to the beach. Not a beach at a lake or ocean. But the perfect man-made sandy beach surrounding a constructed swimming hole at Brewer Park in Old Ottawa South, just across from Carleton University. This was in the 1960s and I was less than 10 years old. I remember the convenience of a parking lot (I’m sure this was more important to my stressed-out mother than to me), as well as a large building that housed changing rooms, washrooms and, most importantly, a snack bar. 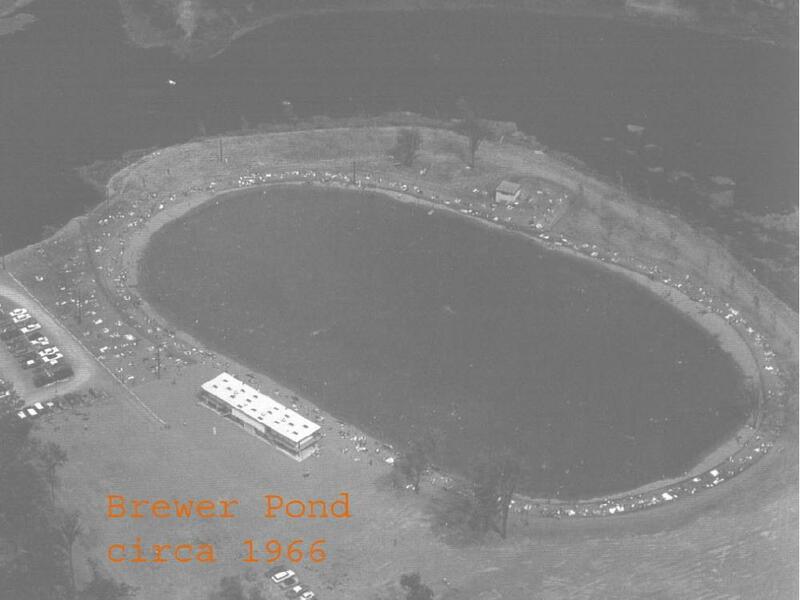 Pasty white children would scream and splash and swim in the mirky water, which slowly percolated until the levels of bacteria and urine hastened its closure some years later. ….with the once pristine sandy beach gradually being replaced with bull rushes, alder, Manitoba maple, willow, larch, milkweed, wild spirea and others. Not to mention hosts of wildlife including rabbits, birds, foxes, turtles and very active beavers. But there was a problem. 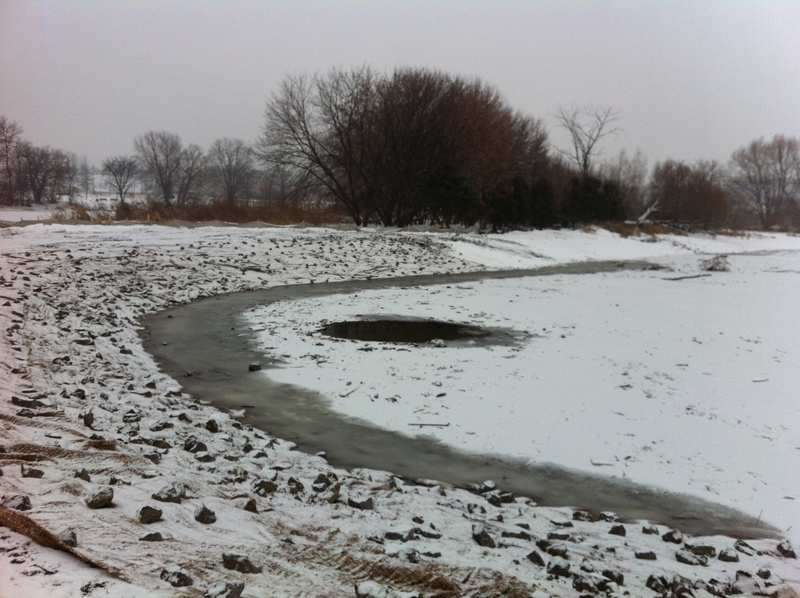 Every spring, snow and ice run-off from up river would rush downstream and flood this section of the park. What resulted was not only damaged and uprooted trees but also a redistribution of river fish and other aquatic creatures into the pond. Sadly, they became prisoners there after the flood subsided. Because the water was stagnant, it became anaerobic (or lacking oxygen) so with time, the relocated fish and other organisms suffocated and eventually expired. 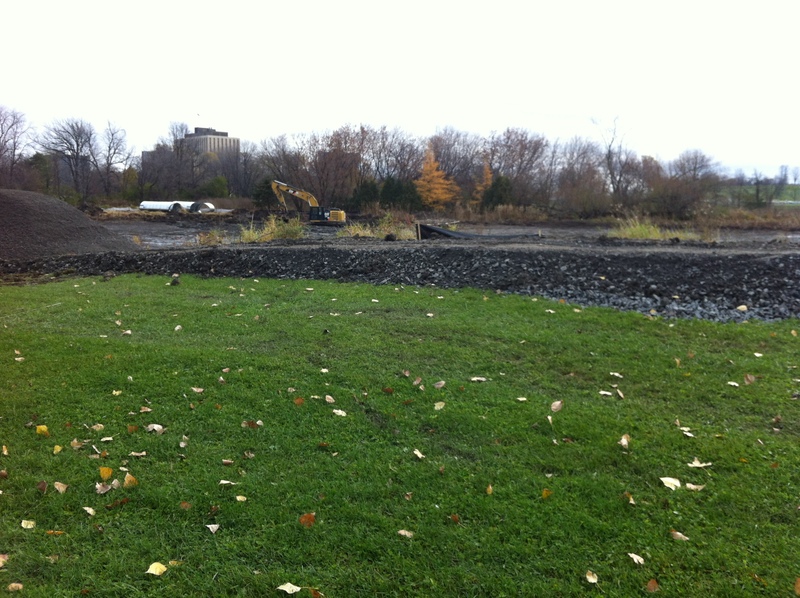 The edge of the Rideau River in this location had once been much more dynamic, but this was before I was born. Channels defined islands which existed apart from the park’s fields and provided paths for the spring waters to follow, preventing serious flooding. Fast forward to today: in the last 40 years the naturalized area around the swimming hole has once again been buzzing with life, both wild and otherwise. A well traveled foot path circumnavigates the pond making it a popular place for play, peaceful contemplation and socializing amongst people and specifically, their dogs. In the great tradition of the revitalization of natural spaces, largely paid for with development dollars (one wetland destroyed = another one re-created), overseen by those who know how to achieve it (i.e. the Rideau Valley Conservation Authority) and work carried out by contractors who specialize in large-scale earth moving, habitat protection and species relocation, the project was begun this past fall. The idea was to re-connect the pond with it’s mother, the Rideau River. Over the last decade, at least, ideas about how to do that were bantered about. I remember being involved in early discussions that involved ECOS, the Environmental Committee of Old Ottawa South (which has now been integrated into OSCA’s general operating principles) and various partners and players (Mike Lascelles, Michael Loewen, Hedrik Wachelka and others). For example, one or possibly two channels could be dug to allow unobstructed water flow through the landmass — a good idea, but this kind of land severing would require a way for people to access the resulting island. I asked about using foot bridges like the elegant rusty steel one at the Dominion Arboretum. “Too expensive,” was the answer, and there was an issue with it being washed away in the spring floods. 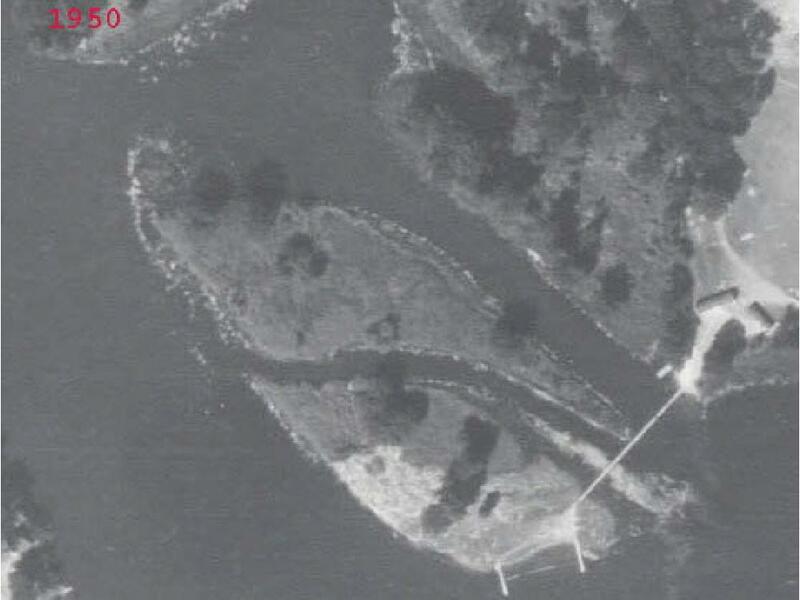 So over a period of several years, the ideas for how to achieve a link with the river resulted in the notion of a single culvert on the down-river side of the pond. It would mean water would still rush over the area during the spring thaw but that afterwards, fish and aquatic creatures would no longer be trapped. And more than this, river-bound fish would hopefully choose to re-enter the newly oxygenated pond and use it for spawning. 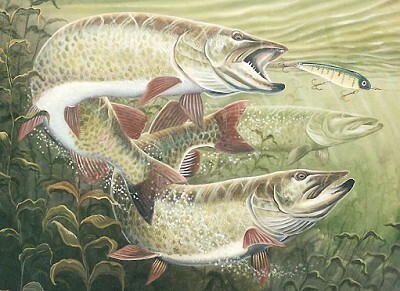 Enter Muskies Canada. You might not know this but the Rideau River, especially around the Bronson Bridge is a hot-bed for fresh water giants like muskie and pike. If you’re a duckling, you’re shuddering right about now…but if you’re a fisherman, you’re overjoyed. So, in October 2014 work began. 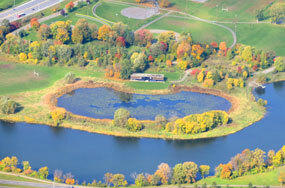 First, as many creatures living in the pond as could be trapped or caught were collected and re-located (with the exception of the very active beaver family.) 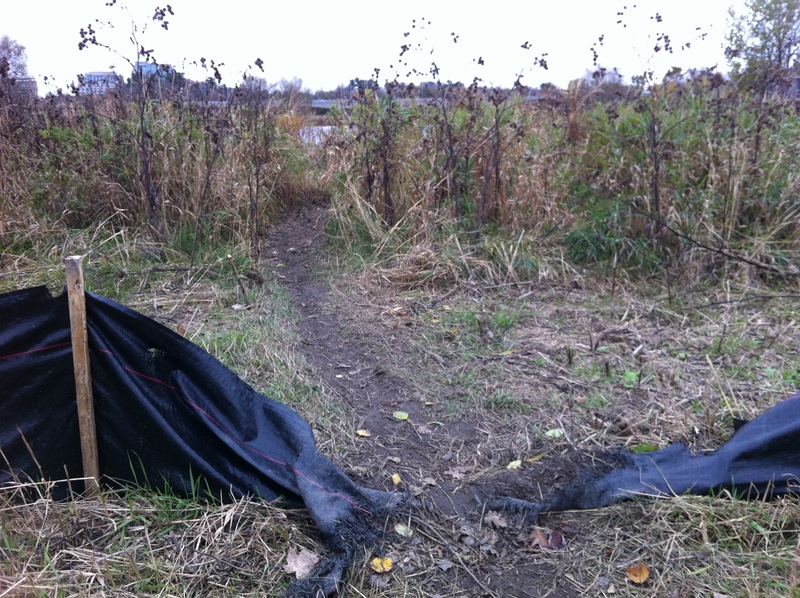 Then a low level barrier consisting of landscape fabric and wooden posts was erected around the pond to theoretically keep them from returning. Nobody told the beavers this. 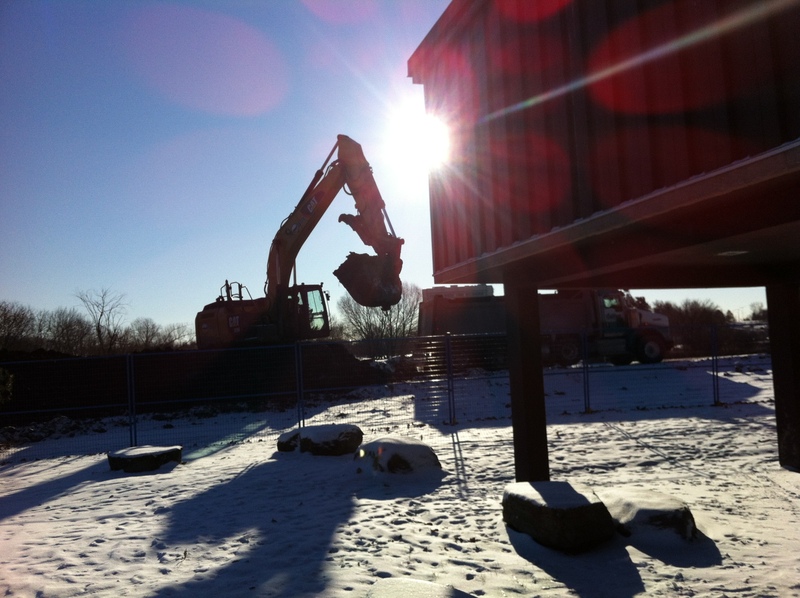 Then the metal fencing went up and heavy machinery moved in. 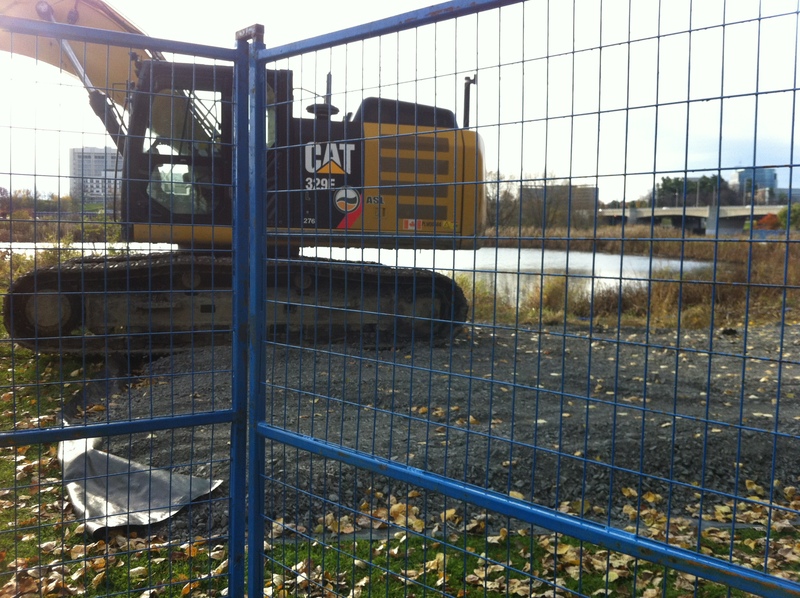 Two or three giant excavators moved in and began scooping out the perimeter of the pond after the draining was complete. Huge metal cylinders were brought in to act as culverts, linking the dredged pond to the river. Once put in place, they will remain completely invisible to all but the creatures who swim through them. ….until finally the machines were gone and the only evidence of the new connection between the pond and river is this opening in the ice. 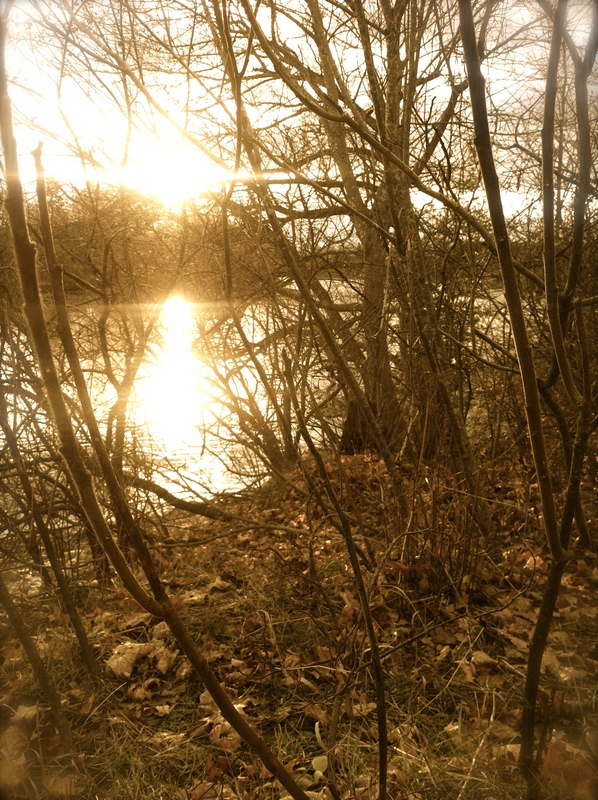 I can’t wait to see what the spring brings…..more to come!